The Nature Conservancy is collaborating with Florida Department of Environmental Protection, Charlotte Harbor Aquatic Preserves and the City of Punta Gorda to launch an oyster reef restoration project adjacent to the Trabue Harborwalk. There's something for everyone! Civic groups, schools, clubs, boating groups, recreational clubs, church groups—or anyone looking for a fun way to help restore the estuary are welcome to participate. It is the first oyster restoration project in the northern portion of the estuary and three methods will be tested here: oyster mats, oyster bags and loose shell secured by a perimeter of oyster bags. These materials will provide a foundation for oyster larvae to settle and grow. The three-dimensional structure of an established oyster reef can help protect the project site's mangrove shoreline from the future impacts of erosion and sea level rise and provide valuable habitat and food for other species such as fish, crab, shrimp, and birds. Oyster reefs have the potential to also benefit the juvenile stage of the endangered smalltooth sawfish, a species that relies on healthy red mangrove habitat for food and shelter in the Charlotte Harbor region. This project will add to the scientific understanding of how oyster reefs might also benefit sawfish. 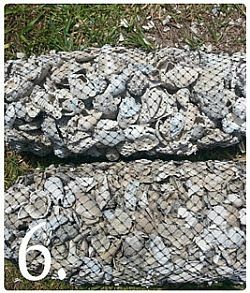 Kate Aug, Florida DEP- Charlotte Harbor Aquatic Preserves Community Outreach Coordinator is still in need of volunteers interested volunteering to make oyster bags as a part of the Trabue Harborwalk Oyster Habitat Creation Project.